Packing tape is activated by pressure. By applying pressure to the tape, the adhesive is activated, bonding properly with the surface to be adhered too. The better you press packaging tape down the better it sticks. 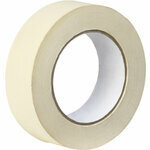 It is important to use a cello tape dispenser which applies the packaging tape with a roller to press it down. Firm, consistent pressure should be applied for best results. 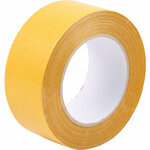 Curing time is the time the tape takes reaches its maximum adhesion. 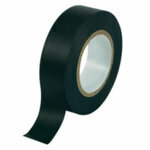 Most adhesive tapes the adhesive is time sensitive and needs to be given a chance to bond with the opposing surface. Bring down the flaps of the box. Start with a holding strap of tape across the flaps to hold them in position. Run a length of packaging tape along the length of these so the join is under the middle of the tape. The packing tape should run 50 to 75mm over the edge onto both ends of the box. The packing tape is pressed firmly down onto the box to ensure good adhesion. Packaging tapes consist of a backing material known as the carrier and a layer of adhesive attached to one side. The most common types of carrier are PVC, polypropylene and kraft paper. Polypropylene and kraft paper based tapes have a lower environmental impact when compared with PVC based tapes. Low cost solution for carton sealing. Will not tear but susceptible to splitting. Requires fair amount of pressure when applied. Requires minimum amount of pressure when applied. 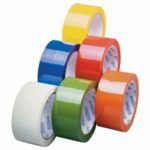 PVC (poly vinyl chloride) tape. Solvent adhesive that bonds instantly. Quality solution for carton sealing. Resistant to moisture and extreme temperature changes. Can be torn by hand but susceptible to splitting and can fracture on impact. High tack rubber adhesive tape. Used for mounting signs, trims and kickplates. Has an adhesive on both sides. Strong and very sticky making it ideal for carpet fitting and other heavy-duty applications. Ideal for paint work and delicate surfaces. Easy to tear and removes cleanly from surfaces. 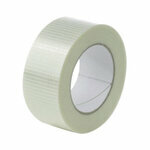 Use poly cloth tape for binding, reinforcing, protecting goods. Also referred to as duck tape. Adheres to most surfaces including metal, concrete and wood. Used for marking and color coding parcels and boxes. Designed to be silent during use. 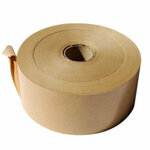 Neck sealing tape is used to tie the neck of bread bags using a bag neck sealer. 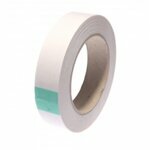 High strength, high tack crossweave tape with high tear resistance. 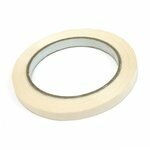 Used for heavy duty and high security sealing. Low noise, high strength polypropylene adhesive tape. 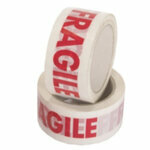 Ideal for sealing parcels that contain fragile material. Also combine with protective packaging such as bubble wrap. 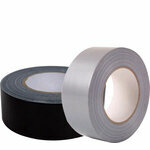 PVC insulation tape is ideal for insulating, attaching, bundling, sealing and marking cables. Made of vinyl it is designed to stretch and conform to irregular shaped surfaces. For sealing cartons and envelopes. Provides a secure, tamper evident seal. The box fibres bond with the tape to create a seal that is impossible to tear off. Unaffected by extreme temperatures and thus ideal for deep freeze. 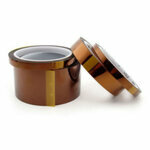 Kapton heat tape for high temperature masking applications. Tensile strength: Measures the force required to pull something to the point where it breaks. Backing material: Material of a tape the adhesive is applied to - i.e. vinyl, cloth or polypropylene. Elongation: How far a tape can stretch before it breaks. Core size: The inside roll diameter of a tape. Vinyl tapes: Can not be torn by hand. Requires a dispenser and will work down to 2°c. Polypropylene tapes: Adhesive tape that can be torn by hand and withstand extreme temperatures. Below is a list of typical applications and recommended tapes. In all cases the surface must be clean, dry, free of oil, grease, dirt, dust, fibres etc. Self adhesive paper and polypropylene water based acrylic tapes. PVC, solvent polypropylene, polypropylene water based acrylic tapes.